Matt's of I'm Just Walkin writeup of the Steinway Street Clock in Astoria reminded me of our photograph of the Albert S. Samuels, Co. clock on Market Street in San Francisco. 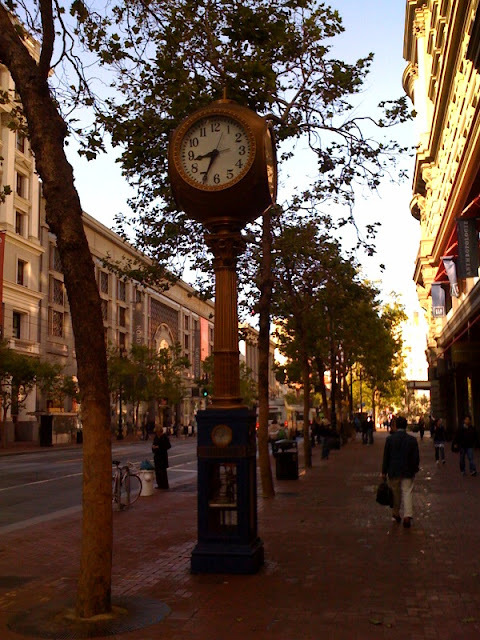 The Samuel's clock was installed in 1915 and is a registered San Francisco landmark. It figures that Mr. Samuels was a watchmaker. One, he installed a clock for the sidewalk in front of his business. And two, according to Forgotten New York, most street clocks - in New York - were placed outside jewelry stores to attract customers. Learn more about New York City's street clocks on the Street Clocks page of Forgotten New York.